Effect of Ancient Celts on British/Irish Art. Britain and Ireland did not participate in the genesis of Celtic art; indeed, it is not clear whether at that time they were even occupied by people speaking Celtic languages. A strong insular tradition lay outside the main-stream of West European development, and it is ironic that the area where Celtic languages now survive was originally the most marginal and last to be incorporated within the world of Celtic culture. Nevertheless, a pattern of political and trading contacts with the Continent, involving the importation of items of fine metalwork and perhaps from time to time also movements of population, had existed even in the Late Bronze Age, and areas of the eastern coast of England - the Thames Estuary, East Anglia, the Yorkshire Wolds - provided foci of interest in the new styles of the fifth and fourth centuries BCE. However, few direct imports of early Celtic art are known - none until the third century - and then only at scattered find-spots in the Thames Basin, Wales and Ireland. What is remarkable, then, is the speed and confidence with which distinctively insular styles of Celtic designs grew up from the later third century BCE onwards, on the basis of features of the continental Sword Style with local innovations in conception and treatment. Sword-scabbards, shields, and the unique piece of horse's head-armour from Torrs in Scotland, form a first generation of insular products, based on bold repousse work and fine engraved decoration such as flowing, linear scrollwork. The rise of an important East Anglican school of gold-working, using plastic designs cast in relief, was a significant innovation and it was paralleled in the production of a magnificent series of engraved bronze mirrors whose large, circular fields allowed the development of intricately filled but symmetrically balanced compositions. The use of hatching developed in the latter context as a way of defining ornament on extensive, flat surfaces. These new styles were reflected in a second generation of weaponry, such as scabbards with plastic decoration and hatching. As the Roman frontier drew nearer, and eastern England in particular grew rich from trade across the North Sea, new forms of decorated objects became common and technological changes, such as the use of enamel, took place. Horse-gear became an important medium for display, through the rein-rings and attachments which were often decorated in colourful enamel. Vessels for drinking and serving imported wine or native brews became more common, as the aristocratic families imitated southern modes of life. When the Romans finally conquered what is now England, the free Celtic areas beyond the frontier, in Ireland and Scotland, continued to provide contexts in which craftsmen could exercise their skills in the service of warlike masters who wished to continue the wearing of traditional symbols of wealth and power. It was not until about 300 BCE that the first elements of Celtic La Tene art from the Continent arrived in Ireland. Amongst the earliest objects is a gold torc from the west of the country, found in a bog at Clonmacnoise, Co Offaly, which might have been imported from the Rhineland. Within a generation or two, crafts centres were established, notably in the north-east of Ireland, which produced Celtic metalwork of the highest technical and artistic excellence. Such a centre must have existed at or near the site of a major hoard of metal objects found in the last century at Lisnacrogher, Co. Antrim. Here there were armouries producing spears, finely-wrought swords, and bronze scabbards which were engraved along their length with flowing, freehand vegetal designs of leafy spirals, S-scrolls and wave-tendrils. Such motifs have their ultimate background in Continental Waldalgesheim ornament and display artistic inspiration from as far away as the Middle Danube. By the birth of Christ the introduced art style is transformed by the stamp of insular personality. Ornament becomes increasingly dependent on the compass and compositions are more formalized and geometrically arranged. In time, the trumpet curve appears and is used long after the introduction of Christianity. Ornamental design is two-dimensional or in the round, engraved in metal, bone or stone or cast or hammered in bronze and, irrespective of the medium, there is great artistic homogeneity across the country. A whole range of native types appears, high-quality items undoubtedly produced under the patronage of a ruling aristocratic elite. Elegantly-cast bridle-bits of bronze are particularly common, but small dress-fasteners of bronze, frequently embellished with elaborate cast or engraved designs are also known. In Ireland, as in Britain, the use of red enamel was an important innovation of this period. Gold is rare but the superb Broighter collar from Broighter, Co. Derry, with raised scrolls and background engraving, is an outstanding masterpiece of Late La Tene craftsmanship. Impressive too, are the great, curved, sheet-bronze trumpets. A small group of exceptional bronzes, dating to the early centuries CE, represents the climax of Irish La Tene craftsmanship. These include two fragmentary head-pieces, one from Cork, the other unlocalized - the so-called Petrie Crown - and a small, dished disc from the River Bann. On these there is raised, fine-line ornament of consummate delicacy, produced, either wholly or in part, by background tooling of the bronze. Celtic art in Ireland, as elsewhere, is essentially abstract. Birds' heads are, however, by no means infrequent and their presence may well have been imbued with votive undertones. The finest ornithomorphic renderings are on two cast-bronze cup handles, notably that from Keshcarrigan, Co. Leitrim. Animals are virtually unknown. The human form, too, is only occasionally found in metal but there is a series of carved stone heads which shows that Ireland shared with the rest of Celtic Europe a veneration for the human head. A single, crudely impressive human carving in wood from Co. Cavan serves as a reminder of what must once have existed in this material. Ireland, never occupied by Roman legions, ensured the continuity of Celtic art into the period of developed Christianity and it was here that the Celtic tradition blossomed, culminating in the masterpieces of early Christian art of the eighth and ninth centuries. This relatively late piece, made not long before the Roman conquest, was found with other pieces of horse gear. It demonstrates the way in which the use of red champlevé enamelling was used to create a contrasting background on a flat surface, in the same manner as hatching and relief work. This parade shield, found in the River Thames, has an unusual fourfold symmetry. Its simple, well-spaced designs in broad circular fields contrast with the narrower, vertical emphasis of earlier examples. The glass roundels are used in the same way as coral studs. This concave knob with a circular panel of ornament in low relief was probably the yoke terminal of a chariot. Although most writers have seen its vegetal tendrils as closely related to the Waldalgesheim style, its symmetry also could suggest a later date, perhaps contemporary with the mirror series. This D-Shaped harness attachment displays a combination of enamel and relief decoration, in particular on the bipartie collars formed of opposed hemispheres. 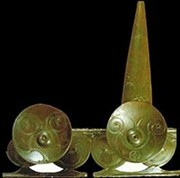 This unique object is a pastiche of a shallow pony cap (with holes for the ears) and a pair of curved tubular terminals, probably derived from a pair of drinking horns. The ornament of the cap, decorated with disciplined repousse scrolls, has been repaired several times. Bird-heads and engraved scrolls in the style of the early shields or of the Witham locket pattern the horns. This tubular gold bracelet displays repousse ornament in the "Snettisham" style common to goldwork from East Anglia. The style was named after a gold torc found nearby. The mirror-image across the longitudinal axis of a running scroll, which defines a series of pelta-shaped voids, produces a balanced but dynamic pattern. This example belongs to tall shields, decorated with repousse bosses which are linked by a vertical spine to terminal roundels at the top and bottom. The high relief of the central boss, garnished with well preserved coral settings, is composed of opposing circular voids formed by a rotating scroll pattern, which creates a strong sense of movement. The terminal roundels contain engraved scrollwork in the style of the Torrs horn-terminals. This boss, known as the "long" or "mask" boss to distinguish it from another, circular example from the same stretch of river, is decorated with high relief repousse work in the form of two diagonally opposed bird's heads which constitute part of a rotating scroll. This pattern ends at the top (and probably, originally, at the bottom) in a mask, similar in kind to those which on other shields. Carnyxes are wine instruments which were used widely in Iron Age warfare, and were represented, for example, on the Gundestrup cauldron. Carried vertically, the carnyx takes the form of a long tube, which terminates in an animal's head. This particular terminal represents a boar, and when found it had a wooden clapper in its mouth. This object, cast in the lost-wax technique, is one of a number of such three-dimensional figures designed to be attached to a larger object. It was probably the handle of a box. These are bronze mounts belonging to a wooden stave bucket used for serving drink, The three-footed bucket is sheathed with three bronze bands and the uppermost band is decorated with repousse work, where the repetitive motifs indicate the use of a stencil. The most notable feature is the handles, solid castings which stand up from the rim and take the form of plumed human heads. Found in a bog with a gold ribbon torc; the buffers at the front of this gold torc are decorated with repousse scrolls highlighted by background stippling. The "box" at back has raised, interlocking ribs patterned with a meander ornament of applied gold wire. The clasp mechanism operates by inserting one of the side tubes into the hollow buffers and securing it in position by inserting a transverse pin. This object was found in a lake with three similar specimens which are now lost. Raised hammered ornament is arranged symmetrically around the mouth of the trumpet so that one half is the mirror image of the other. The design on each side is organized, around a running wave pattern which terminates in boss-ended spirals and sub-peltate motifs. The engraved, free-hand ornament on this scabbard plate is based on a sequence of four S-figures with thin tendril-like stems which tail off, at the broken end, into a squashed "running-dog". Typical of the Irish scabbards is their short length. Found with other gold objects in a flood plain, the relief decoration on this gold torc is hammered on the tubes and is constructed of stretched and interlocking S-scrolls in combination with trumpet curves, snail-shell spirals and other motifs, all of which are set off by a background aT overlapping compass-drawn arcs. The terminals, one of which retains the original granulation imitating tiny pearls, were made separately. Rectangular in section with two decorated sides, the ornament on the piece consists of geometric, compass-drawn patterns similar to those on the bone flakes from Lough Crew. This cast disc, gently convex in shape and of unknown function is decorated with a raised fine-line ornament produced by hand-tooling. The design, compass-drawn, consists of a central whirligig from which springs an open-armed, spiral-ended triskele. The ends of the triskel are formed into stylized birds' heads. One of a pair, this horse-bit was found in a bog with other harness items. Cast decoration, composed of opposing S-scrolls and elongated ovals combine to form a series of sub-peltate figures on the side-links.  For information about the artistic history of Ireland, see: Irish Art Guide.  For more on the history of Celtic crafts in Britain, see: Homepage.